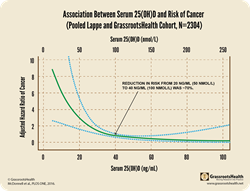 GrassrootsHealth study underscores the importance of vitamin D levels of at least 40 ng/ml for cancer prevention. I am now even more convinced of the importance of vitamin D for cancer prevention. In a study published online today in the journal, PLOS ONE, GrassrootsHealth found an inverse association between vitamin D serum levels and all non-skin cancer incidence. The analysis included pooled data from two study cohorts of women aged 55 years and older. Those with vitamin D serum levels ≥ 40 ng/ml, had a 67% lower risk of cancer when compared with those <20 ng/ml. Vitamin D is created naturally in the skin through sun exposure and has been found to have many health benefits. Vitamin D is also available as a supplement. The findings of this study suggest that, regardless of how you get it, having a vitamin D serum level of ≥ 40 ng/ml is important for optimizing cancer prevention. GrassrootsHealth is a nonprofit public health research organization dedicated to moving public health messages regarding vitamin D from science into practice. It has a panel of 48 senior vitamin D researchers from around the world contributing to its operations. GrassrootsHealth is currently running the D*action population intervention program to solve the vitamin D deficiency epidemic worldwide. Under the D*action umbrella, there are programs looking at the entire population as well as targeted programs for breast cancer prevention and a ‘Protect Our Children NOW!’ program to reduce the complications of vitamin D deficiency encountered during pregnancy and childhood.